A fabulous and previously unseen model; Liberty & Co low box seat Arts & Crafts inlaid oak hall or bedroom settle (possibly originally for a children`s nursery). 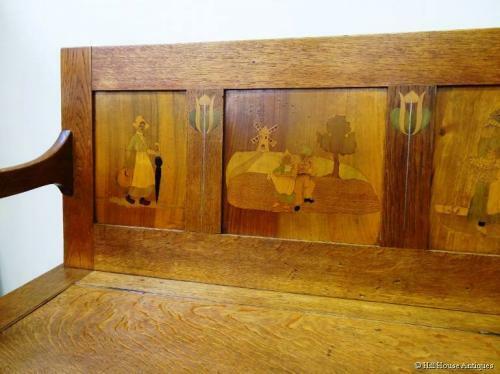 An absolutely charming piece of furniture with typical inlaid marquetry panels of Dutch children, windmills and tulips, with the box seat storage interior subdivided into sections; possibly for the children`s toys or clothes; c1900. Approx 56" wide, 31" overall height, 15" deep.